Fibromyalgia is a chronic condition characterized by widespread body pain. Possible causes and risk factors of fibromyalgia include genetics, hormonal imbalance, trauma, surgery, rheumatic disorders, stress and disturbed sleep patterns. The exact cause of this condition is unclear. 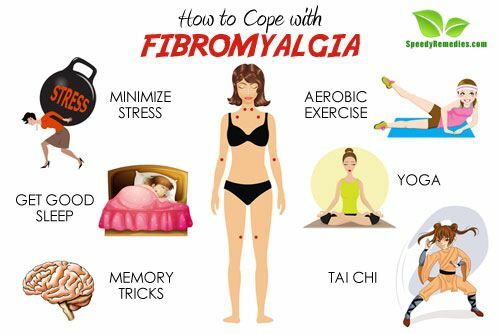 Symptoms of fibromyalgia include debilitating muscle pain, numbness or tingling sensations; sensitivity to noise, odors, bright lights, medications, certain foods and cold; stiff joints and fatigue. Fibromyalgia patients also tend to have migraines, irritable bowel syndrome, temporomandibular joint (TMJ) disorders, sleep disorders, anxiety and depression. There is no definitive cure for fibromyalgia. The main aim is to relieve symptoms. This often requires a combination of treatments and therapies to help reduce pain in fibromyalgia. Stress may play an important role in triggering fibromyalgia. Experts feel that fibromyalgia flare-ups can be reduced if there is a reduction in anxiety, stress and depression experienced by fibromyalgia sufferers. so, take time out for relaxing your body and soul. According to a 2002 study published in the Seminars in Arthritis and Rheumatism, 57% of the fibromyalgia patients had clinically significant levels of post traumatic stress disorder symptoms. Yoga is an effective tool to help you deal with fibromyalgia symptoms like pain, anxiety and fatigue. Gently stretching your body will help you loosen up your tight muscles and relive pain. It will help you achieve mental, physical and spiritual balance. According to a 2011 study published in the International Journal of Yoga Therapy, yoga can help improve fibromyalgia symptoms like stiffness, anxiety, and depression. Fibromyalgia patients are known to have lower cortisol levels. Cortisol is a hormone produced by adrenal glands in response to stress. Lower cortisol levels contribute to pain and fatigue. A 2011 study published in the Journal of Pain Research shows yoga’s positive effects on cortisol levels in fibromyalgia patients. Beginners should start with gentle postures that enhance relaxation. As far as possible, avoid strenuous poses. You can start with Hatha yoga, Iyengar, Kripalu or Viniyoga as they are simple exercises. Setu Bandha Sarvangasana (Bridge Pose) and Uttanasana (Standing Forward Bend) is good for your spinal cord. Garudasana (Eagle Pose) is good for stretching the shoulder muscles in upper back and Bhujangasana (Cobra Pose) to extend the back while opening the chest. Gentle head rotations are perfect to relieve tension in the muscles in the neck area. Breathing deeply is very important for fibromyalgia patients and therefore Savasana (corpse pose) is quite helpful in relieving tension and stress. Choose a quiet and serene spot to start your yoga practice. Place a nonskid mat or a non slippery towel on the floor. Start with one or two poses in your first few sessions and gradually proceed further. Begin with five minutes yoga practice every day and gradually increase the time to 30 minutes. Stick with postures like Downward Dog and Tree while you are battling with fibromyalgia. These poses are simple and are not painful to perform. Listen to your body. If anything hurts, pull back a little. Don’t stop it altogether. Tai chi, an ancient form of Chinese exercise, combines meditation with slow, gentle movements, deep breathing and relaxation. It can improve muscle strength, stamina, balance, flexibility and coordination. It relieves stress and helps you improve body awareness. If regularly practiced, this form of exercise is believed to help you sleep better. According to a 2010 study published in the New England Journal of Medicine, tai chi may be a useful therapy for fibromyalgia patients. Those who practiced tai chi had shown significant improvements in pain, fatigue, stiffness, balance and well being. Any form of physical exercise can make a significant difference in the health condition of fibromyalgia sufferers. Low impact exercises help you to reduce pain by keeping your joints and muscles loose. According to a 2008 study published in the Journal of Rheumatology, aerobic training has beneficial effects on the symptoms of fibromyalgia. Exercise helps increase serotonin levels, the so-called ‘happy hormone’, which keeps your mood elevated. Although fatigue and pain may make it difficult for you to exercise, gentle exercises will help you build your stamina and endurance. Start with walking for 5 minutes on the first day. Gradually increase the time with each passing day and walk for 30 minutes every day as it will increase the blood circulation to muscles and tissues. If you are sensitive to the outer environment, try walking inside your home. Apart from taking energy-boosting supplements, you need to take food rich in minerals and vitamins. Adequate amount of nutrients can provide you with energy. Eating a well-balanced diet including fruits, veggies, whole grains and lean protein will help you gain more energy to stay active. According to a 2001 study published in BMC Complement Alternative Medicine, a raw vegan diet significantly improves fibromyalgia symptoms. Fresh fruits, salads, raw vegetables, carrot juice, nuts, seeds, whole grain products, tubers, flax seed oil, extra virgin olive oil are some of the foods that may improve your overall health. Nightshade varieties of vegetables like tomato, potato and eggplants are said to aggravate arthritis and pain in some people. So, it may be beneficial to avoid these kinds. Avoid alcohol and caffeine. Although caffeine is known to increase your alertness, it can make things worse for fibromyalgia patients. Even a small amount of caffeine can contribute to sleep disturbances and restlessness. Food additives like monosodium glutamate may also trigger pain. This flavor enhancer is found in Chinese, packaged and fast food. Avoid artificial sweeteners found in diet soda and sugar-free sweets. Go for a low-carb and low-sugar diet. Most of the fibromyalgia patients have low adrenal functioning. This may affect the metabolism of carbohydrates and may lead to hypoglycemia. The National Fibromyalgia Research Association recommends limiting or eliminating refined sugar, fried foods, and highly processed foods. Keeping a food diary is a good idea to track what foods cause a flare-up and what eases your fibromyalgia symptoms. Work with your doctor or develop strategies that help you manage your sensitivity without preventing yourself from enjoying your life. Omega-3 fatty acids are unsaturated fats that have anti-inflammatory properties that help decrease neuropathic pain. They can help curb joint pain and stiffness. These fats also help you deal with fibro-fog. Include two fish-based meals per week. Fishes like salmon, tuna, mackerel, anchovies, herring and salmon are rich in Omega-3. Other sources of Omega-3 fatty acids include walnuts, flax seeds, and canola and soybean oil. Take 1 or 2 tablespoons of fish oil daily or take Omega 3 supplements. But do this only after consulting your doctor. Try sticking to regular sleeping patterns. Get into bed and wake up at the same time every day. Avoid caffeine and alcohol in late afternoons or evenings. Although alcohol can make you feel sleepy, it disturbs your sleep. Consuming caffeine, chocolate, soft drinks close to bedtime can disturb your sleep. Keep your bedroom dark and quiet as a cosy bedroom will entice sleep. Avoid taking spicy food and liquids close to bedtime. Heartburn and frequent trips to bathroom will disturb your sleep. Reserve your bed only for sleeping. Avoid taking your laptop, mobiles or any other distractions to your bed that may hinder getting a good sleep. Listen to a soothing music or take a warm bath before going to sleep as they may help you to wind down and get a sound sleep. Spend your energy wisely. You need to prioritize tasks so that you won’t run out of your energy reserves before the end of the day. Identify what is important and what’s not. Focus your energy on what is necessary. Prioritizing can help you reduce stress and anxiety. When you get stressed out, your muscles get tensed up and this can aggravate fibromyalgia pain. People suffering from fibromyalgia find their symptoms worsen if they try to manage too many tasks at one time. Make it a point to take frequent breaks. Writing in a journal every day is helpful when it comes to self-inquiry. The journal can help you understand how and when your symptoms begin and what causes them. You will be able to notice any emerging trends as to when your symptoms get better or worse. This may help you avoid those factors that can trigger the flare-ups or seek relief before your symptoms get too unbearable. When you have a written record of a fibromyalgia flare up, your symptoms, your mood and the events preceding the flare up, you can effectively deal with that type of situation the next time it arises. For example, if you are writing that you haven’t slept well since last few days and it has caused you pain and fatigue. Months later looking back at the entry may help you recognize identify a certain lifestyle trigger that causes fibromyalgia symptom flare-ups. Soaking in a hot tub will help you relax your tense muscles, reduce pain and improve movement. Take a warm bath right before bedtime. The fatigue caused by the exertion of shower might help you to get some sleep. Baths are better than showers as during baths you don’t have to stand so it can be less exerting. If you are temperature sensitive, try taking a bath keeping your bathroom door slightly open as it will let the steam and hot air escape, keeping the bathroom cooler. Warm, moist heat decreases the secretion of stress hormones and raises the levels of endorphins – your body’s natural painkillers. Many fibromyalgia patients continue to work either full or part time. Staying active will help you cope with this condition, provided you don’t overexert yourself. Although the chronic pain and fatigue can make working in fibromyalgia difficult, you will have to make some modifications at workplace. Openly discuss about your condition to your employers and colleagues. You may need rest periods on bad days or work from home option in case you feel fatigued. If possible, cut down your working hours or try shifting to a less demanding job. Many individuals with fibromyalgia suffer from mental confusion along with memory loss and difficulty in concentration. These problems are often referred to as ‘fibrofog’. Difficulty in remembering names and details, putting a coherent sentence together, reduced attention span, lack of alertness and inability to remember things are all symptoms of fibrofog. Sometimes poor sleep can also exacerbate cognitive problems. According to a 2004 study published in the Journal of Clinical Rheumatology, over 50% of the patients with FMS complain of memory decline and mental confusion. Use a calendar or a computer to remember appointments, birthdays and special events. Set alarms to remind you things like when you need to make a phone call, attend meetings or even for heating your food for dinner. Routine is necessary for people suffering from cognitive impairment. Routines for simple tasks can help you deal with brainfog. For example: Take out the garbage before taking a bath. Daily regimes will help you create a daily pattern of activities that will boost your memory and reduce your frustration. You don’t have to make an effort to remember things; you will form a habit of doing tasks in proper order. Avoid multi-tasking. Trying to do too many things at a time will make it difficult for you to concentrate and it will unnecessarily stress you out. Try to complete one task before proceeding with another. Reducing clutter is the best way to help your brain function properly. Disorganized place tend to stress people out and can create confusion. Clutter will make it harder for you to concentrate and focus. Create a place for everything and make sure things are stored where they belong. For example: As soon as you return home, hang your car keys at the designated place before doing anything else. By doing this, you are less likely to lose the keys and you won’t be frustrated trying to remember where you placed them the next time you need them. Make a list of important phone numbers and paste it on the wall next to your bedside. Use pocket recording message tape player which you can use to record messages for yourself. Try doing crossword puzzles to exercise your mind. Making a to-do-list can help you bring relief to your confusion. Jot down grocery lists and errands to do around your house. Stick post-it notes on refrigerators or kitchen cabinets to help you remind things. This can serve as a reminder for daily simple tasks that can be easily forgotten due to fibrofog.